Aaron Schradin who was truly a pleasure to work with on this project. 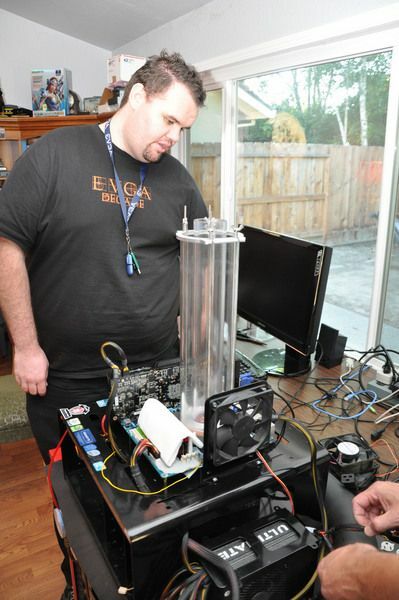 Simon Solotko from AMD for his help with this project also. Special thanks to Chew for the use of his TWKR. Chew is a top notch bencher, one of the best, and very nice, helpful guy ! One of the things that I really like about benching computers is the cooling aspect of each run. 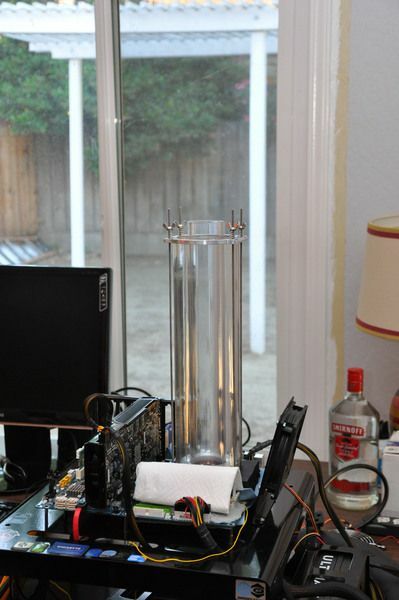 I have tried to stay on top of as many types of Extreme Cooling as I can, given the resources that I have. One question I remember hearing one time was “how does become a really good bencher”, something along those lines away. 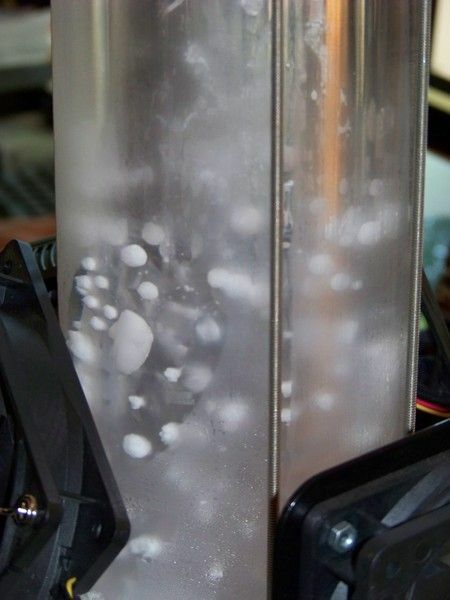 The answer was pretty simple, get the best cooling you can and the rest will follow with lots of hard work. I began using many methods of cooling but SS Phase really got my attention at first so off I went to find one of the best units I could at that time. After some time a SS Phase unit built by one of my favorite builders, Jin Park, was in my shop and I was soon benching away with that. 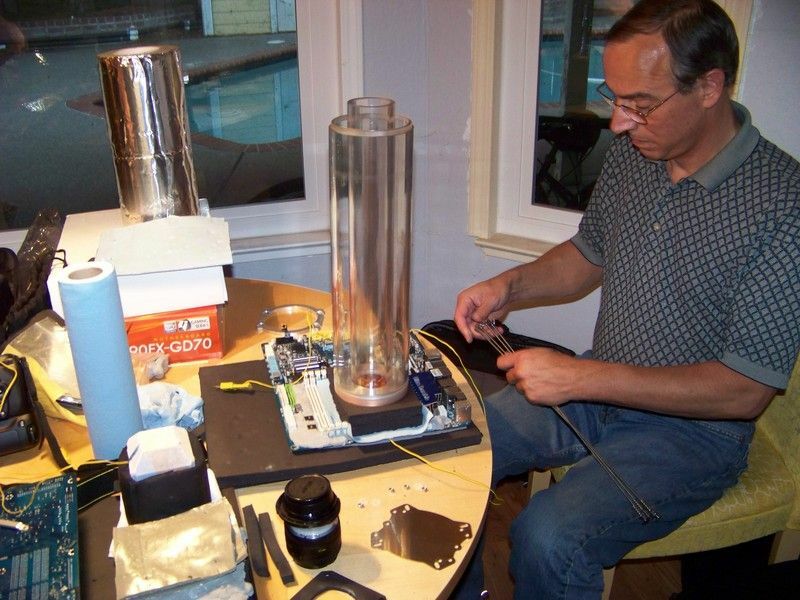 It became very clear to me at that time that even though this SS Phase unit was very well built and could hold CPU’s at very good temps under high loads, aprox -51c unloaded and I have not gotten that unit below -39c under high loads, that it was just not cold enough for what I wanted to do. But I had the Phase/Cascade bug bad ! 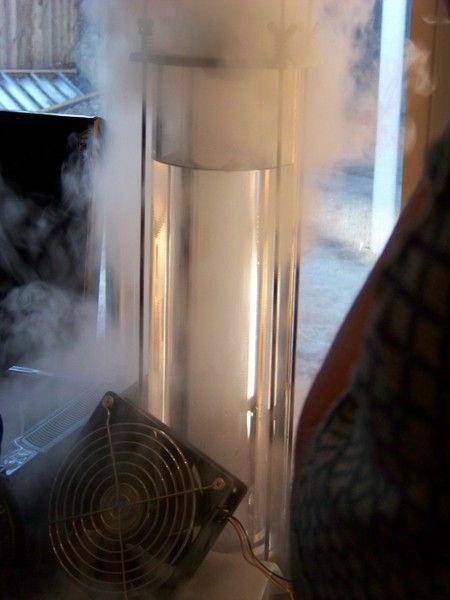 I then moved on to LN2 cooling as being able to get a Cascade was very hard to do. Yes this website XS has had a very bad influence on me LOL ! The next problem was a Dewar to hold LN2 in for benching. This was also not an easy thing to find. Keeping a eye out on ebay and other places I finally found a Taylor Wharton LD50 with pressure top and this has served me well. Sometime later I had the chance to go to XS in Las Vegas for a very special event, the AMD LHe event where AMD CPU’s would be taken down to temps unheard of and benched at Extreme Conditions. At this event I saw several new pots being used, one was the early LHe pot built by Aaron Schradin with Simon Solotko. Another event later in Austin Texas by AMD again the video Xtreme Conditions was created and I had the first chance to see the Phantom LN2 Evaporator. I saw this video and became very interested in this new tech for LN2 cooling. Getting in touch with Aaron Schradin and we soon had a new pot being made for me. Aaron was a pleasure to work with on this project, very friendly and I believe he wanted to make a pot like no other. It was a few weeks to get all this done and after many emails exchanges, ones like “It’s Shipped”, and “It’s in your town now !”, I finally had this monster of a LN2 pot in my hands. When I opened the box my eyes were like as wide open as they possibly could, I just went OMG when I held it for the first time. The pot that Aaron made for me is rather big for a LN2 pot at 15” tall. Careful materials selection is critical! • Why copper, and what type? – At normal operating temperatures, there is little noticeable difference in thermal conductivity values in various copper grades. – However, as temperatures decrease, conductivity of various grades increase at drastically different rates. – Increase of a factor of nearly 10 times at the peak! The base is rather complex and from what I understand took a fair amount of time to machine out. It is not simple holes drilled into a base of copper. So now that the Pot is here and ready to go I invited a few friends over for a benching party so they could see this wonderful pot in use also. They were Cpt. 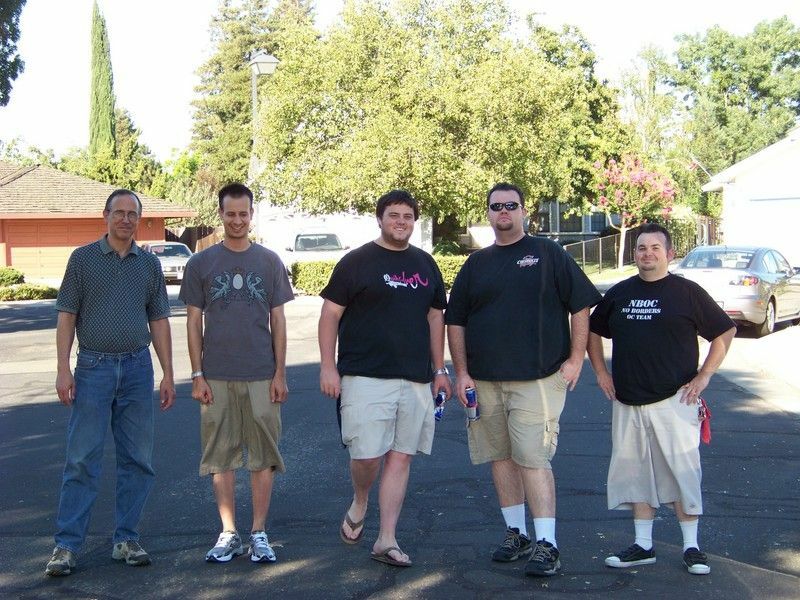 Planet – Jake, Punx – Shannon, and Nick from EVGA, Nordic Jedi from 411overkill and ocgmj from NBOC. The Phantom was setup and benching started. I must add here that this was my first encounter with this pot and was very tried when we ran this test. I had assumed that the pot was ready to go and had forgotten the instructions on applying the Teflon Tape on the mating surfaces, yup I am a idiot ! Out here in Calif getting 190 proof alcohol is impossible so I ended up using 80 proof vodka. The test was started and soon found that we had leaks, and alcohol had leaked into the main chamber and would gel up and clog the base of the pot. That was unfortunate for this event but caused no serious problems. Now I am not sure if the effects we saw were because of the leak but we had rather strange results from this session. One of the effects that we noticed early on was how it pulled down temps. 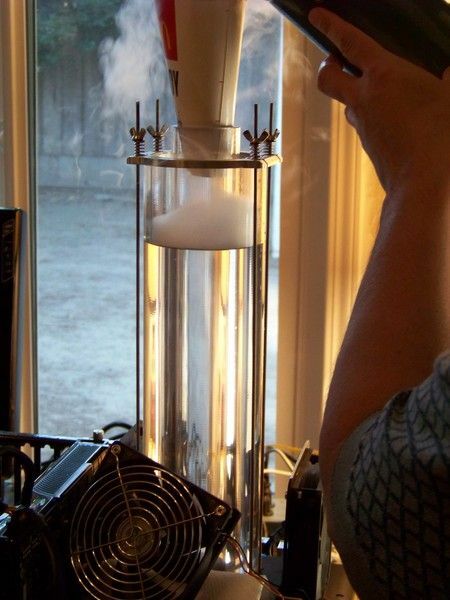 I would pour a good dose of LN2 into the pot and it would start to drop temps, but we reached a point where more LN2 being poured would actually warm up the pot. The best zone of LN2 we found was to keep the level of LN2 just down at the base. 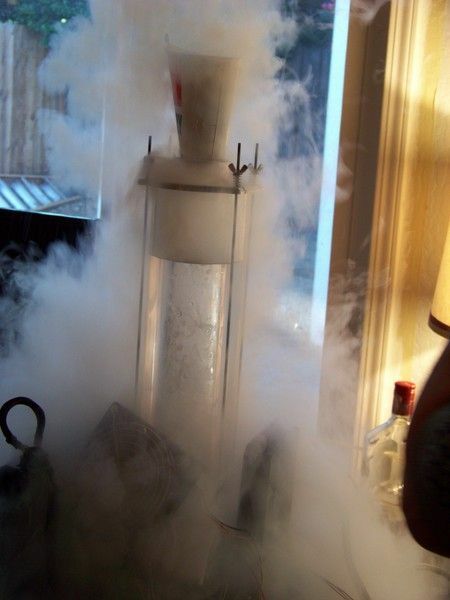 But filling up the pot to the top was ok for the first cool downs and made a really good show With a small dose of LN2 in the base it would make strange noises as the LN2 was moved about and being jetted around by the design of the base. As we started benching the leak had began to clog up the base with gelled alcohol and we saw pretty bad temp swings and was impossible to keep at a given temp. 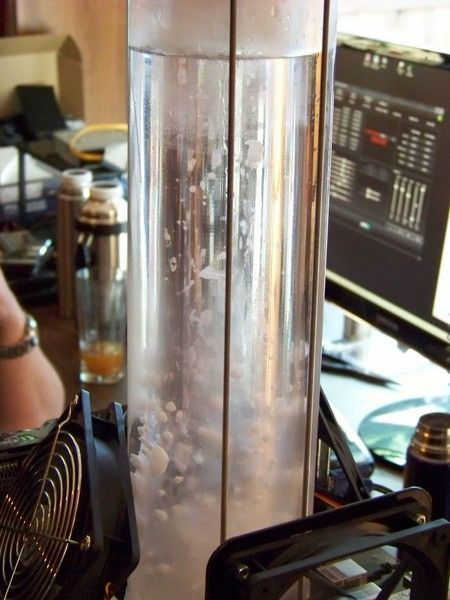 We ended up stopping as the whole column was starting to gel up pretty bad. I has installed the temp probe in the eraser next to the CPU heat spreader. I am not sure if it was reading correctly there as we only saw a max temp of -159c I think it was, maybe because of the stacking effect of LN2 in the chamber, I am not sure. Conclusion was that using 80 proof alcohol was a problem with how long you could run the pot before it started gelling up, higher proof = longer runs. I will have to try and find another liquid for this. 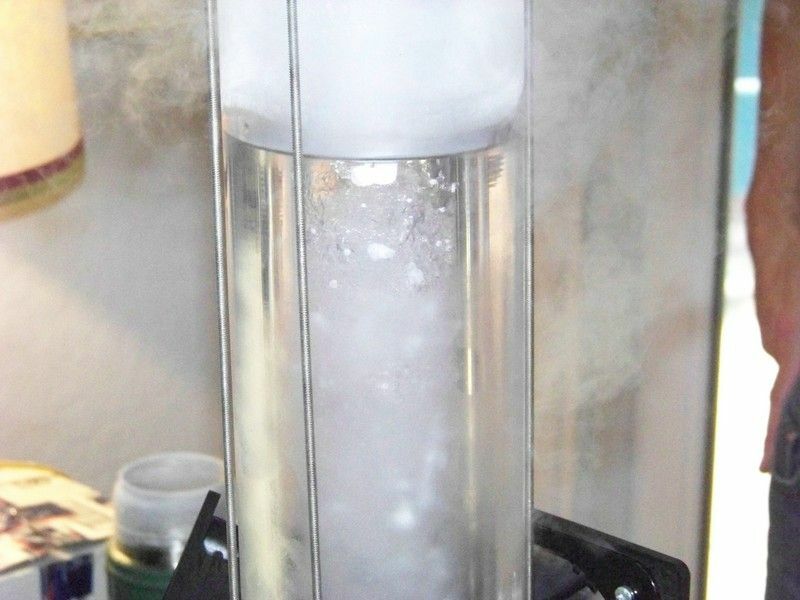 This is a extremely well made and nice evaporator and has strong possibilities for future use and tuning for better effects, there are a few problems with it now as any new tech has but I think that this can be figured out and tuned for better effects. It makes a really nice show but with size of the one I had built, but using it with one person is rather hard. But this pot would make a great addition for any benching show and other events. Here are some pictures and video of its use. The video is rather simple and crude. I am not a video artist, yet anyway and we were pretty tired when this was taken early in the morning. But it gives you a idea of how it looks and the gelling problem we saw. I will get the leaking problem fixed up for the next run. As with any new tech things evolve and change, I think this design has promise and I am sure it will improve with future units. Just like the very first LHe evaporators evolved I am sure this design will also. So take this as a first peak, or second anyway at some very exciting new tech that I am sure will become better with future models. We don’t really have any benching results from this run because of the problems I stated. So here we have some prepping up pictures. 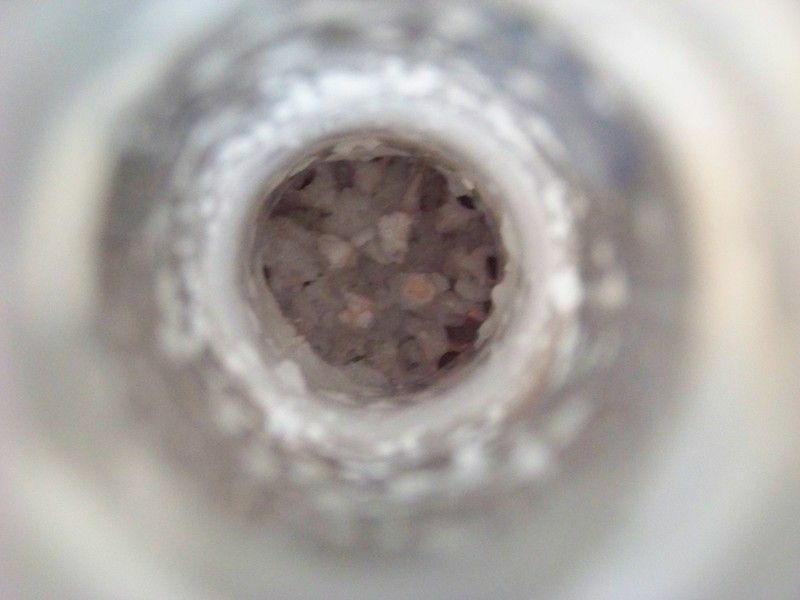 Here we start seeing some of the alcohol start to gel up, this is the inside of the LN2 chamber were alcohol has been blasted up in the tube. 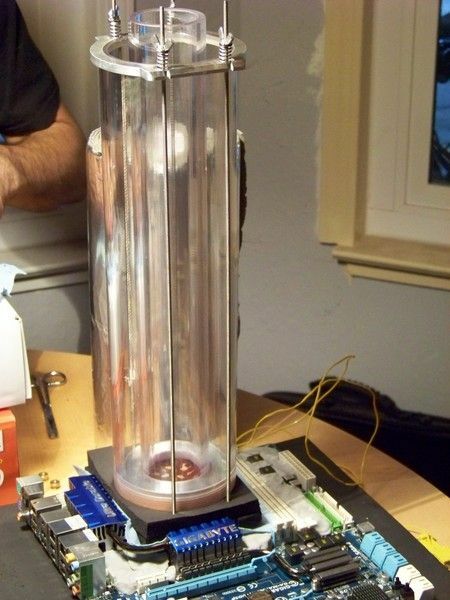 And what it looked like in the base chamber when we finished, it was pretty clogged up. And the crazy bunch of rabid benchers who were dead tired but continued to bench away for 18 hours LOL ! Last edited by Kal-EL; 07-27-2009 at 03:16 PM. that pot is sick, and i think with the new setup on it... vs the show tube I think will really perform well. This is some serious write up there! Keep up the good work. Next time I'll take my time and take a flight form NY to bench with you guys! BTW: This thing is a monster! As for the performance. 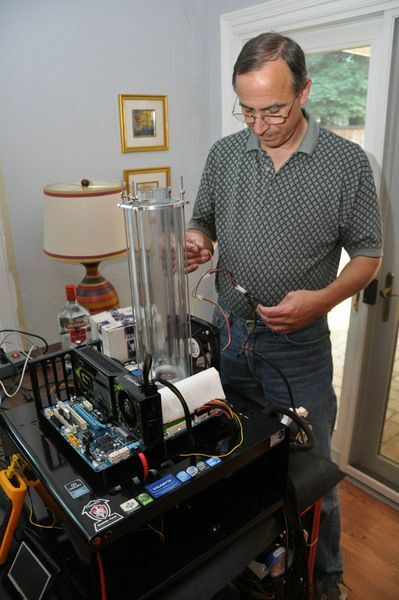 Not an extreme cooler, and not a smart guy by anymeans... but with alcohol freezing at so low a temp would not a run to wally world for some $1 pints of 91% been better than vodka? I do not know your area, I assume it is as urban as New Jersey/Pennsylvania. Only WalMart I have seen that was not 24 hours was in West Virginny. 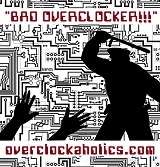 Wicked awesome write up Bill and snaps to everyone that made it to the party. So jealous would love to have seen that thing in action. Looks intense. Last edited by Neuromancer; 07-26-2009 at 05:56 PM. Was just telling Bill... dunno if it works on everything... but when i have warm beer that needs a chilling. A cup of water a few tsps of salt and a dozen ice cubes works great. EDIT: State Laws on Alcohol are weird. The Blue Laws in PA, no liquor sales on Sunday, no sales after 6 pm other days, bars close at 2 AM. WV has Blue Laws too, but than you can get beer and wine at the gas station or Grocery Store till 2 AM 6 days a week, till midnight on Sunday. New Jersey has the same rules as WV for times, but you have to go to a bar or distributor to get it. Last edited by Neuromancer; 07-27-2009 at 04:54 AM. You guys had great time there as I can see! That thing is even huger than I thought. Did I miss it or what is the tubing made of?